Monthly wall calendar features two full months per page so future planning is at your fingertips. Dated planning pages range 12 months from January to December. One-page-per-two-month spreads include a full-year calendar reference along the bottom, ruled blocks (3"" x 2-1/4""), plenty of writing space, Sunday-through-Saturday scheduling, count of days/days remaining, holidays, and federal holidays highlighted in red. 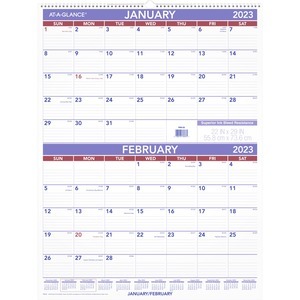 Wall calendar offers wire binding with hanging loop and is printed in blue and red ink.